Talking about a mixed bag. I was really liking the movie at first, until its second half kicked. I won't say it completely ruined the movie, but it did ruin quite bit for me. Crazy thing about this movie is that it is doing an awful lot right, but it still manages to mess up plenty of things as well. In some ways it really is an above average, low-budget, genre attempt, but in the end I still can't really recommend it to anyone. It is crazy how this movie lets things slip out of its hands, while it was well on its way to become a great and enjoyable genre attempt. It is basically a whodunit, mixed in with some slasher elements. I really enjoy this approach and the build up to its mystery and suspense is all quite good. The movie has good pace, things are always progressing and the characters are all set up quite well, despite the fact that most are some very stereotypical ones. I however feel that in a way this was intentional. The movie knows what it wants and what it is trying to be. It is obvious that the film-makers know the genre well and use all of its clichés in a pretty effective way. It is a real pleasant movie to watch, that appears to be good looking and well made, until its second half kicks in. 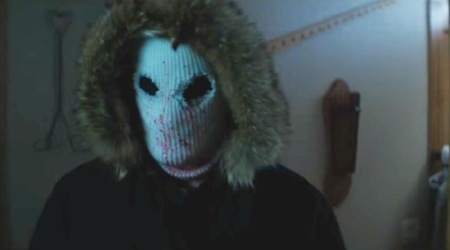 Once the movie goes all out with its slasher elements, the movie becomes a terribly ineffective and formulaic one. It is weird to see how poorly handled all of the slasher elements are. The build up, the suspense, it is all gone, while the movie was still doing such a great job with this in its first half. Even the gore and kills feel terribly disappointing, as does the big 'reveal' at the end. It is all so terribly ineffective and uninteresting. It is almost as if you are watching two completely different movies, that fail to connect with each other. Maybe it is also true that the second half of the movie is a bit too far over-the-top, compared to the rest of it. Going from subtle to extreme is something that only works out for a handful of movies. It still has to feel connected to each other all, which in this case it really doesn't. In short; this movie is a great build up to a far from satisfying second half, that lets the movie down and even nearly turns it into terrible movie.